Halloween Party Decor … BOO! Fall is my favorite time of year. I love the changing season and all the beautiful colors that come with it. I admit, aside from leaves changing color, pumpkins, hot apple cider and hay rides, Fall also means Halloween. I LOVE Halloween! 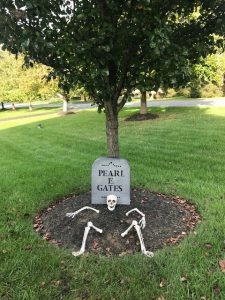 It’s enjoyable seeing trick-or-treaters all dressed up ringing our door bell on October 31! I love carving pumpkins, decorating with hay, and gourdes and ghosts, and yes, even dressing up. Our dog even gets a costume for little candy seekers to see. This year I threw an adult Halloween party. Something I have always wanted to do. 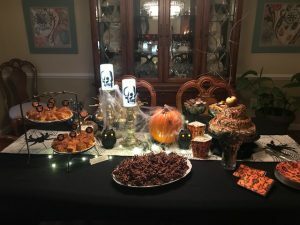 This party was unlike the Halloween parties I threw for my girls when they were growing up. To my happy surprise everyone came in ‘creative costumes.’ They had clearly put their Halloween spirit to work! 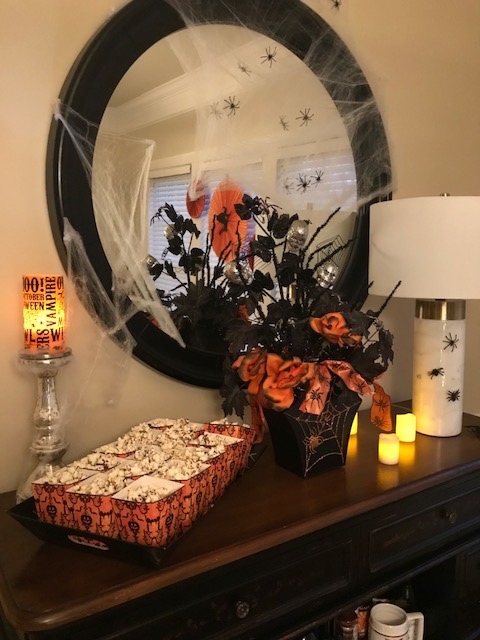 I started planning and putting my crafty ideas to work in mid-August for a mid-October Halloween party. A lot of my inspiration came from magazines, craft stores, Pinterest … and well, my own ideas. 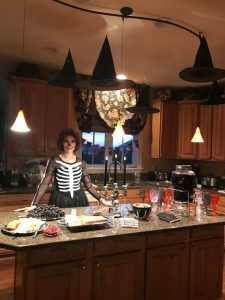 I hope you are inspired by an idea or two from my party when you host your own Halloween BOO night for adults! 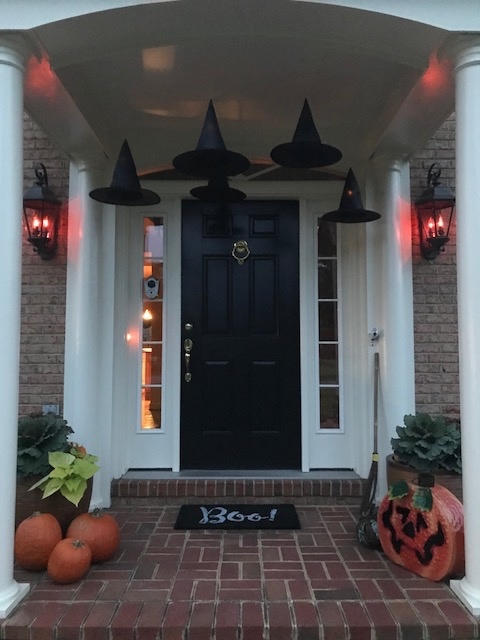 Front Porch – Floating witches hats with tea lights. 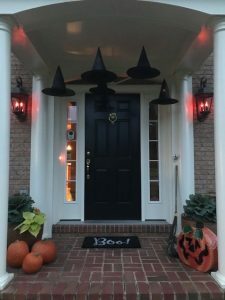 Pumpkins, ornamental cabbage and flickering porch lights. Tomb stones made with decouage, cardboard, newspaper and spray paint. Foyer – Creepy mirror wreath, spell book, potion bottles and spiders. Cheese cloth ghost in the upper right hand corner – boo! 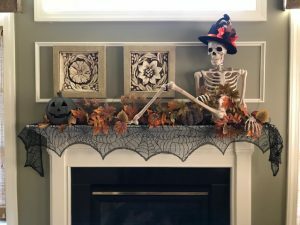 Mantle – Mr. Bones in a black top hat. 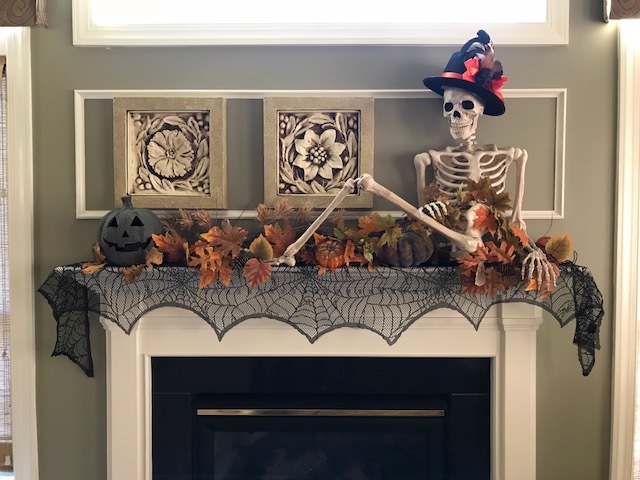 Bought skeleton and fall leaf vines at JoAnn’s. Top hat bought at Home Goods. Island – Skull head beverage dispenser with skull goblets. 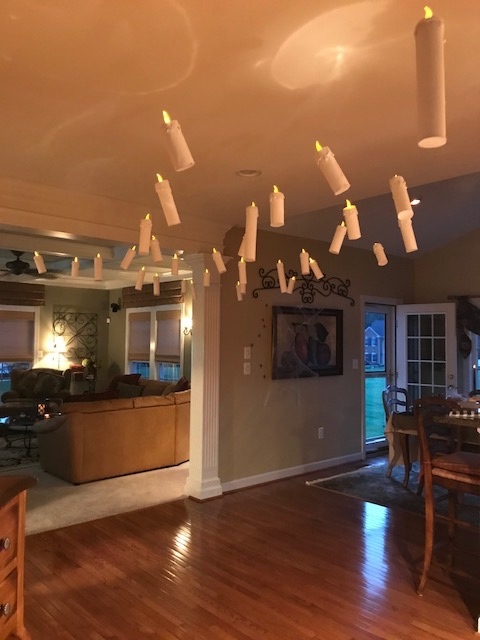 Floating witch hats with tea lights. Dessert Table – includes chocolate haystacks, caramel apples, salted caramel apple cake. Dark chocolate drizzled sea salt popcorn. Floating candles and fog machine magic. Welcome to the In Touch! 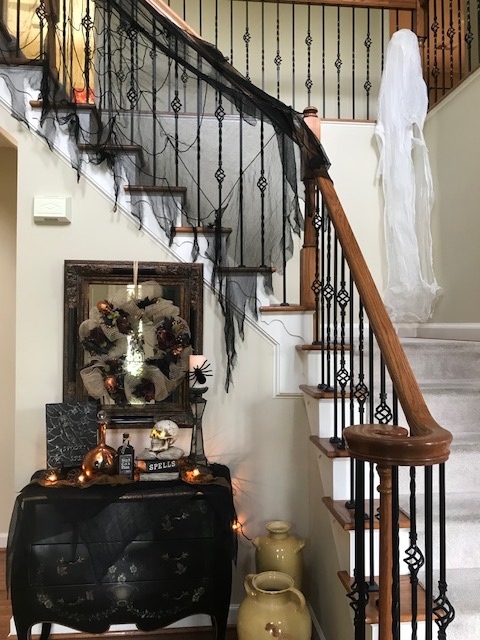 blog, with home design ideas and tips from Finishing Touches Design Services. Please check back often for great design ideas for your home, and don't forget to visit our website at www.roomsdesigned.com. Thanks for dropping by! 4 Simple Holiday Tree Enhancing Tips! Decorate a Simple Basket for the Holidays!